Porous Pave, Inc., produces, in its words, "highly porous, flexible and durable pour-in-place surfacing material." Its XL surfacing product is half recycled rubber chips and half stone aggregate with a urethane binder, while its XLS surfacing is 100 percent recycled rubber chips and a more elastic urethane binder. The standard colors for the surfacing is black, gray, tan, green brown, cypress, redwood and blue. The company is now offering custom color combinations of the standard colors: gray-black, tan- black, brown-black, cypress-black, red-black, brown-tan, green-brown, and blue-grey. "In the decade since we first introduced Porous Pave, landscape architects and contractors have experimented with mixing two or more of our solid, standard rubber colors," explains Dave Ouwinga, president and CEO of the company. "The custom colors offer the eight combinations proven best for harmonizing permeable paved surfaces with a variety of landscape and hardscape designs." The surfacing begins with discarded tires, which are shredded and processed into one-quarter-inch rubber chips. Instead of coating the outer surface of the rubber with paint, which would fade, crack and flake off, the manufacturer's method is to infuse the chips with dyes and UV inhibitors. The engineered surfacing spec notes a 29 percent void space that allows water to permeate and filter down through a compacted aggregate base, then slowly seep into the soil below, thus reducing erosion from runoff, and slowing the velocity of peak runoff into storm drains and storm sewers. The company reports independent testing that verifies up to 6,300 gph per square foot can drain though the surfacing. The surfacing is used on driveways, parking areas, building entrances, patios, terraces, courtyards, walkways, sidewalks, trails, golf cart paths and even loading docks. The surfacing is also being used for pool surrounds, and schools and parks are installing the 100 percent rubber chips product for playgrounds and splash pads (for its slip resistance). The surfacing can be installed on grades up to 30 degrees. Rubber recycled from 300 tires creates a two-inch thick surfacing covering 1,000 square feet. To visualize that, half of a single's tennis court (27'x39') is 1,053 sq. ft. Using a standard mortar mixer, mixing time is under a minute, and curing time is 24 hours. 24 Landscape Architect and Specifier News h a rd s c a p e s n e w s Custom Colored Porous Surfacing Porous Pave, Inc., has introduced eight custom color combinations for its pour-in-place porous surfacing. 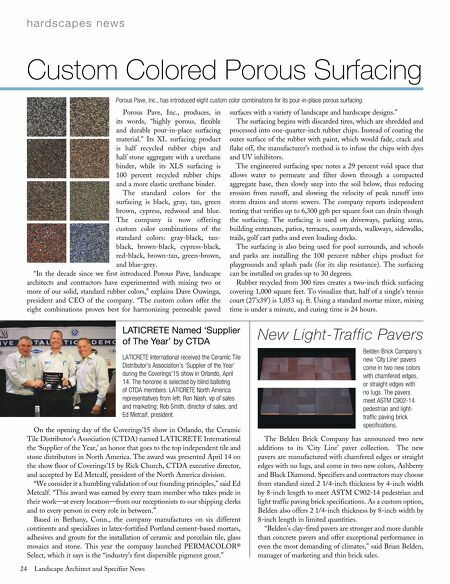 New Light-Traffic Pavers LATICRETE Named 'Supplier of The Year' by CTDA LATICRETE International received the Ceramic Tile Distributor's Association's 'Supplier of the Year' during the Coverings'15 show in Orlando, April 14. The honoree is selected by blind balloting of CTDA members. LATICRETE North America representatives from left: Ron Nash, vp of sales and marketing; Rob Smith, director of sales, and Ed Metcalf, president. Belden Brick Company's new 'City Line' pavers come in two new colors with chamfered edges, or straight edges with no lugs. 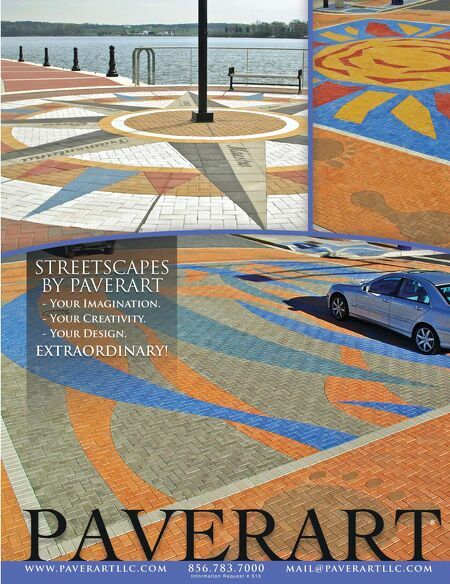 The pavers meet ASTM C902-14 pedestrian and light- traffic paving brick specifications. The Belden Brick Company has announced two new additions to its 'City Line' paver collection. The new pavers are manufactured with chamfered edges or straight edges with no lugs, and come in two new colors, Ashberry and Black Diamond. Specifiers and contractors may choose from standard sized 2 1/4-inch thickness by 4-inch width by 8-inch length to meet ASTM C902-14 pedestrian and light traffic paving brick specifications. As a custom option, Belden also offers 2 1/4-inch thickness by 8-inch width by 8-inch length in limited quantities. "Belden's clay-fired pavers are stronger and more durable than concrete pavers and offer exceptional performance in even the most demanding of climates," said Brian Belden, manager of marketing and thin brick sales. On the opening day of the Coverings'15 show in Orlando, the Ceramic Tile Distributor's Association (CTDA) named LATICRETE International the 'Supplier of the Year,' an honor that goes to the top independent tile and stone distributors in North America. The award was presented April 14 on the show floor of Coverings'15 by Rick Church, CTDA executive director, and accepted by Ed Metcalf, president of the North America division. "We consider it a humbling validation of our founding principles," said Ed Metcalf. "This award was earned by every team member who takes pride in their work—at every location—from our receptionists to our shipping clerks and to every person in every role in between." Based in Bethany, Conn., the company manufactures on six different continents and specializes in latex-fortified Portland cement-based mortars, adhesives and grouts for the installation of ceramic and porcelain tile, glass mosaics and stone. This year the company launched PERMACOLOR® Select, which it says is the "industry's first dispersible pigment grout."